With the growing number of cord cutters, free broadcast TV has been coming back into the mainstream. And AirTV is riding this tide with their new tuner that helps bring free over-the-air (OTA) broadcast channels into your home over your home WiFi network. AirTV is a clever solution for delivering free broadcast TV to every screen in your home that has broadband access. It uses an ATSC tuner (also called an ATSC receiver) that allows reception of ATSC digital television (DTV) signals, which are broadcast over the air by TV stations. 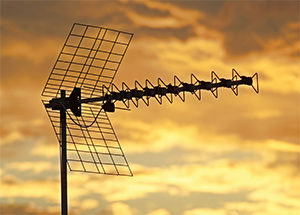 It receives these signals from an indoor or outdoor antenna that you place wherever you have the best signal reception in your home. It then distributes the broadcast channel signals over your home WiFi network to your Android or iOS smartphone or tablet that is running the AirTV app. AirTV is already connected with Roku and Amazon Fire TV boxes. Eventually they plan to stream to other devices as well like Apple TV and smart TVs. The AirTV box retails for $120, with no subscription fees.